Imagine more than a thousand of your classmates jammed together in the gym bleachers. It’s the day before the big game. Over the loudspeakers, an announcer calls out the names of each of the players. After each name, the crowd cheers wildly. This is the pep rally, and it’s one of the biggest events of the year at high schools across the United States. It’s an opportunity to celebrate the school community and to reinforce the expectation that schools train bodies as much as minds. Rallies, and the teams, clubs, and publications that define extracurricular life in American schools, build a sense of belonging for students, faculty, and alumni. A typical pep rally begins with loud music playing as hundreds of students stampede into a crowded gym and join forces withtheir fellow classmates. Voices are raised as students find their friends and as they rush to sit in blocks--freshmen, sophomores, juniors, and seniors. Often the different classes have been asked to wear contrasting colors, so there are blocks of color in the bleachers. Then the pep rally begins, usually with cheers that place students from one class in competition with the others or that make fun of the opposing team. 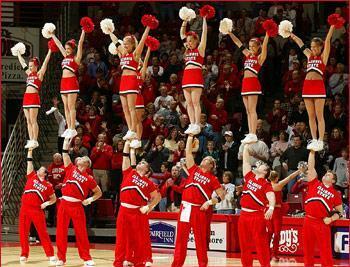 Cheerleaders or dance teams perform enthusiastic routines. The band also takes part. Usually, the rally leadership team leads games in which the classes compete, such as eating contests or dance offs. There are groups of students that put on skits, mini-plays that are based on cracking school inside jokes, making fun of the opposing team, and teasing beloved teachers and well-known school figures. Then the players are introduced, and the coach and school principal often inspire the audience with their rousing speeches. Throughout, free items such as t-shirts are thrown into the cheering crowd. After the presentation of the players, there are more cheers and then the students leave the gym, exuberantly discussing the upcoming sports match. We, the Fulbright English Teaching Assistants, are bringing the idea of a pep rally to our schools in Spain in order to instill the values of community, school spirit, and a sense of belonging. These values are very important in building a sense of identity and belonging to the school. We hope that students will build strong ties within their school community and feel proud of each other, their school and what they can accomplish together with support and enthusiasm. We also hope to give our Spanish students a taste of American life and culture. Most of all, we hope to have fun! After the pep rally, four schools will compete in a basketball game called “The Game of the Year.” In partnership with the U.S. Embassy and the Asociación Baloncesto Colegial, the Comunidad de Madrid has organized two games between two pairs of bilingual schools. In addition to a co-ed basketball team, each school will be represented by cheerleaders and a mascot. Hopefully, the spirit of the pep rally will carry over into The Game of the Year and an electric, enthusiastic atmosphere will result! Maii Hunt - I am from Boston, Massachusetts and graduated from Harvard University last spring. I have many fond memories of the pep rallies at Boston Latin School where I graduated in 2010. I proudly wear the purple and white colors of our team, the Wolfpack! In Madrid I work with IES Avenida de los Toreros. Corey Linehan - Originally hailing from San Francisco, I come to Madrid via St. Louis, Missouri. I studied at Georgetown University, from which I have strong memories of the sense of community and purpose everyone shared on campus. I work with IES Cervantes in Madrid Centro. Elena Ayala-Hurtado - I am from near San Francisco, California and am a graduate of Stanford University, class of 2014. I will never forget the time that I spent sitting with my friends and watching rallies as part of Acalanes High School. I work with IES Antonio de Nebrija in Móstoles. Emma Lamothe - I am from Brimfield, Massachusetts and I recently graduated from Brown University. As a member of the Brown swim team, I loved cheering on my teammates and representing the Brown Bears. I work at IES Dioniso Aguado in Fuenlabrada.